Today my lunch is a bit different. My mum goes to work early on a Thursday so I have sushi bought from the shop. I had two bits of inari which is sweet tofu on rice and two with chicken katsu in it. I had a tub of strawberries and some lemon cake made with our lemons from the garden. Mum said we shouldn’t weigh out how much sugar is in the cake! Amount of his packed lunch my brother brought home uneaten- ate all his sushi and cake. He didn’t take any fruit or veggie to school though! Number of Olympic medals won by Australia-. 9- the UK has 10! 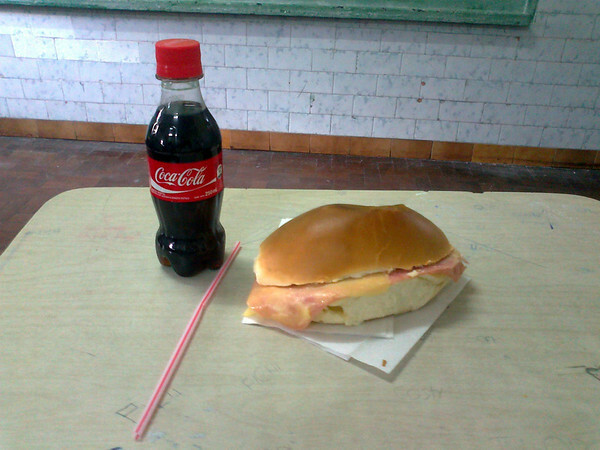 Augustina sent in a really interesting email and pictures of her lunch in Argentina. I'm Agustina from Argentina, Buenos Aires i love your blog, i always read it. We speak Spanish so sorry if im a bad at english. We're in winter vacation, the day before yesterday was my last day.I want to show you how my school works when we talk about the lunch. We have a Buffet where you can buy fizzy drinks, junk food, sandwiches, juice, candies, hamburguers, pizza and that kind of food.As you see we haven't healthy food, and we can't carry food because we have nowhere to leave the it, we haven't lockers so we have to carry our bags all day. I'm a student of 2 year of High School, so i need to eat good. If i want to have breakfast and lunch i need $25 ARS (£4,00).I eat at school wednesday, thursday and friday so it's a little expensive and in some way bad, because i eat bad food 3 times per week. 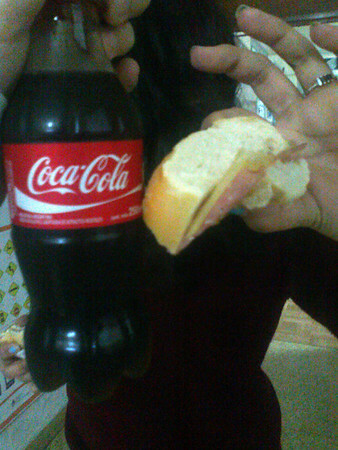 This is my breakfast: it's a small sandwich and a little coke. Cost $10 ARS, £1,50. And for lunch we have exactly the same but with a big sandwich. Mothfulls: 55 & 24 slurps of coke. Pieces of hair: 0 WOW. Well today i talked with my friend about your blog, i told her about your posts, and the lunches that you post here. I was amazed with the breakfast of Tokyo. In my weekends i usually drink some yogurt and nothing more, im not aperson who loves eating in the morning, i love to see how different we are, our habits and i saw that here, Veg i love your blog! Congratz! I would be glad to know what do you guys think about my lunch and breakfast. Your English is great. I understood it all. I think your school food looks unhealthy too. We worked out that if you drink 2 bottles of coke a day that is 16 ½ cubes of sugar. I like coke too for special treats but not everyday and not for breakfast. Hola Agustina, gracias por la imagen de su almuerzo, envió in Es emocionante saber que el blog verduras se lee en todo el mundo. Tal vez debería mostrar a sus profesores el blog para que la escuela puede hacer que las comidas más saludables. No puedo hablar español y estoy usando el Internet para traducir, así que espero que no ha escrito nada demasiado grosero en su lugar! Hello Augustina, Thanks for the picture of your lunch you sent in. It is exciting to know that Veg's blog is read all over the world. Maybe you should show your teachers the blog so that the school can make the lunches more healthy. I can't speak Spanish and am using the internet to translate so I hope it hasn't written anything too rude instead! On holiday in Malaysia my favourite drink was Kickapoo. It was my Dad’s favourite drink when he was a little boy but made us all laugh. Loved the look of your Japanese breakfast Veg. It has given us an idea for lunch tomorrow…. I'm laughing at the Coke and sandwich for lunch. Looks like a typical lunch for an American teenager. While our public schools have cafeterias with meals that fit the Federal School Nutrition Program, what's offered and what the teens actually eat are two totally different things. Especially when schools also have vendors offering fast food and the like. Although many schools have stopped selling sodas during school. The vending machines (if they have them) are turned on after school so the kids can have one if they stay after school for an activity. My mother told me that back in the 1960s, she had a Coke and a candy bar for lunch and saved most of her lunch money to buy records. And we won't even get into what we ate at my school in Singapore. Lots of soda, no vegetables or fruits. We all grew up to be healthy, though. Ha! Yes, when I was growing up, I went through a phase where my typical lunch was a pack of M&M's candy and a Diet Coke. A lot of commentors here are super critical of the health/balance of some of the lunches shown. But I bet it would be interesting to hear what they grew up eating. When I think back to what we considered "healthy" in the 60's and 70's, I cringe now. But still, that's what we ate. Hey, at least it was a diet Coke! I can rattle off my primary school lunch menu from the 70s. This was at an American school in Singapore, not in the states. Tuesday: hot dog and french fries and if you had the $1.30 lunch ticket (as opposed to $1.20) baked beans. This was my favorite lunch. Wednesday was half-day so no lunch at school. Drinks were milk or some kind of fruit punch in a pyramid-shaped carton you cut the corner off and stuck a straw in. Middle and high school were awesome. You ordered off a big menu and while we had a lot of grilled cheese and french fries we also had yummy chicken curry, sweet and sour pork, char sui pork with rice. Our alumni magazine always has a recipe from our cafeteria in it. But we all ate healthy at home. Fast food or pizza was a treat not a staple. I guess that made up for it. And we walked everywhere. I am glad my daughter has a healthier lunch than that. 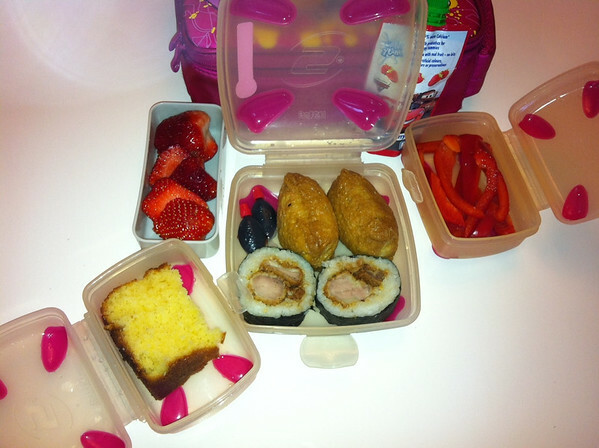 She usually brings a sandwich and fruit/veggie from home but school lunches are much better. Me being one of the more critical commentors here is caused by the fact, that I grew up in the 60's on unhealthy food and now have to pay the price, due to severe restrictions to my health. Everyone arguing that "a little bit of sugar isn't soooo bad" just has to take a look at my BMI and bloodpressure to see where a little bit of too much can lead to. I wasn't educated in my youth about the importance of healthy food. This blog is a chance to reach people young enough to be educated or at least their parents, so they might at least get a chance to decide for themselves, if they want to eat healthier. Pav! I'm so jealous of your lunch today. I've always wanted to try inarizushi, but no place around me sells it and I can't figure out how to make it myself. But I DO make chicken katsu sometimes, which I absolutely love. I never thought to put it in maki sushi, which is pretty smart if you don't want to eat raw fish! Agustina - I'm really sorry that unhealthy food is all you get for breakfast and lunch at school. It's true that most high school kids would prefer to eat junk food, but you're not given any healthy choices at all, and.. :( It just makes me sad. I have to admit, I had to do a google search to learn what Kickapoo is as I've never heard of it. Wikipedia says that it is similar in taste to Mountain Dew, is that true? It is nice seeing pictures from Argentina as I spent last year there of a student-exchange program. It's true they don't sell cooked meals in schools, which surprise me very much. I usually buy biscuits in school and brought my own water. They like ham-and-cheese combination very much, and not only on sandwiches. I'm from Malaysia and sometimes I drink Kickapoo. It's a yellow colour fizzy drink and taste as sweet as all of its kind. My brother likes too call it "kick a poo" drink. Wow Pavlova! Your lunch contained many of my favourite foods! I'm very jealous! Great posts, Agustina - you English is far superior to my Spanish. Agustina, please give up the coke or cut your intake. Hi I my mother is from Batu Pahat in Malaysia, when I was 9 years old I went over there and my favorite drink was Kickapoo :-) I think it was more the name that attracted me to it. Veg's Dad here. I wanted to share this email I received with you all. 'Hello dear VEG, my name is Daniela and I´m from Argentina too! I live in Capital Federal, Buenos Aires, not very far away from the port. I´m 26 years old and i want to explain our schools lunches. There are private and public schools and, in each case, part time or full time schools. Agus´s school probably belongs to the public-part-time schools, that´s the reason why there´s not a proper lunch provided by the school. In the schools that the lunch is included in the daily schedule, the children´s lunches includes (one option per day, they can´t choose): creamy polenta with bolognese sauce, meat and potato pie (we use potato mash instead pie crust), chicken stew with cheese & butter rice, milanesas (thin meat slices dipped into beaten eggs, seasoned with salt, pepper, garlic and parsley with bread crumbs crust) with egg and potato salad, lentils and meat stew, fish milanesas with potato, sweet potato and squash puree, ricotta ravioli with tomato sauce, roasted chicken with rice, carrot and sweet peas salad, spaghetti with tomato and sausage sauce, taglierini with braised meat and tomato sauce. For dessert: season fruit, jelly or flan (the ugly-lots-of-sugar-from the box one, but made with whole milk, so it isn´t soo unhealthy). For drink, plain water. Everything is made from scratch early in the morning in every school´s kitchen! So, kids here get a lot of tomato sauce and starch, very few veggies, and sometimes both meat and starch in the same plate. But, also in many ocassions this is the only whole meal the childrens get in the entire day (ussually this kind of schools are placed in the poorer areas of the city) so the interest is more focused in incorporate calories rather than in a well balanced meal. -- By the way, it is very cold out here! It´s rainy and windy, the temperature hardly reaches the 10 °C and the sun has taken the day off. It´s almost five pm now, and I´m wishing to get out of the office and run to my home to cuddle with mi dog Lana (that´s spanish for wool, because when she was a baby, she looked like a tiny lamb) and watch old Doctor Who episodes. Thank you Daniella for the insight. Im going to a private school, all the explanation is up. Hi Agus! 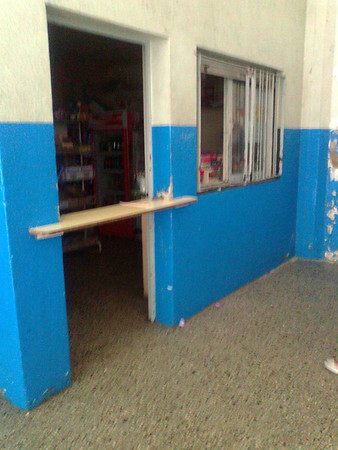 I assumed, for the look of the school´s walls that it was a public school. My bad, I´m sorry. What I was trying to explain is that the lunch that you have when you eat at school is not the only kind available in all the schools.